An herbal dietary supplement advertised as treatment for symptoms of menopause. Who Is Estroven For? How Is Estroven Taken? Estroven is the brand name of several herbal dietary supplements advertised to ease some of the most frequently experienced symptoms of menopause, including hot flashes and insomnia. It first appeared on the market in 1997. There are several different products available depending on the symptoms that need to be treated. The main ingredients in all Estroven products are black cohosh root, a plant found in North America, and soy isoflavones, a phytoestrogen derived from soybeans (soy protein). Estroven products do not contain synthetic or human/animal-derived hormones. The symptoms (and intensity of symptoms) of menopause can vary. The various formulations of Estroven products are advertised as providing relief for some of the possible symptoms of menopause including insomnia, hot flashes, and stress. However, there is only limited research about the safety and effectiveness of products like Estroven for menopause treatment. 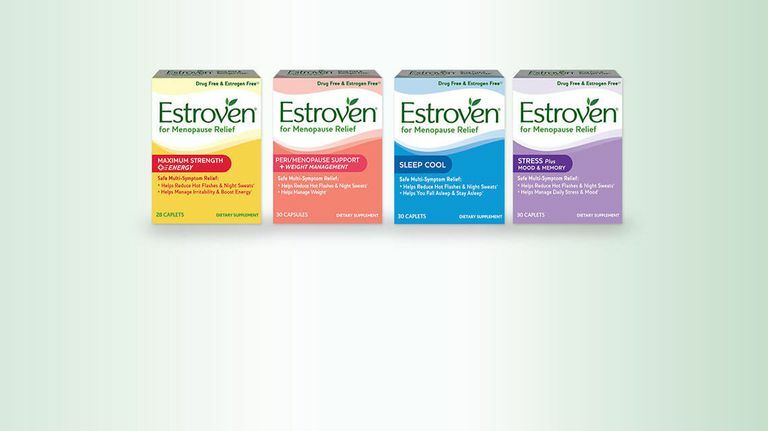 Estroven products are advertised as being designed for people experiencing symptoms related to menopause. When a person experiences their last menstrual period, usually sometime in one's 40s or 50s, they enter into a transitionary period of life called menopause. The experience is gradual and generally occurs over the course of several years. During this time a person may experience symptoms and changes to their body that can range in severity and duration. Most people enter into menopause naturally as a result of decreasing hormones as they age, but they may begin the process early (premature menopause) due to a medical condition, a medication, or surgery to remove the ovaries. Menopause may also be induced if the ovaries are damaged, such as during chemotherapy. Menopause is sometimes treated with hormone replacement therapy (HRT). People who are experiencing symptoms commonly associated with menopause may also benefit from dietary supplements such as Estroven. However, it's important to know that more research is needed to determine if herbal supplements such as Estroven are safe and effective for treating menopause. Estroven is an herbal dietary supplement that comes in the form of a capsule. The supplement can be taken daily with or without food, though taking it with food will help avoid mild stomach upset that may occur when taking supplements. Estroven recommends its products be taken for a minimum of 60 days. Each individual product should only be taken in the dose indicated. Do not take more of the supplement than is directed by the product's packaging or a doctor. People experiencing symptoms of menopause should talk to their doctor before starting Estroven or any other herbal or dietary supplement. Estroven products should not be taken if you are pregnant, breastfeeding, or are trying to become pregnant. Children should not be given Estroven. Estroven products do not require a prescription and are available over the counter at most pharmacies and major retailers throughout the United States. The products can also be purchased online. Estroven reports its products are generally safe and well-tolerated by most people who take them, but it's important to note that the safety and potential for longterm side effects when using black cohosh, a main component of Estroven products, have not been adequately studied. Additionally, a 2012 Cochrane review of one of the supplement's main ingredients, black cohosh, revealed there is insufficient evidence to support it is an effective treatment for menopausal symptoms. Taking products that contain black cohosh can lead to a number of symptoms. While some may be relatively mild, in rare case people taking commercial products containing black cohosh have experienced symptoms related to liver damage — though the exact nature of the relationship remains unclear. The U.S. Pharmacopeia recommends that people with diseases or conditions affecting the liver ask their doctor before taking any supplements that have black cohosh in them. It's unclear if back cohosh has serious interactions with other medications. If you are taking any prescription medications or receiving treatment for a disease, such as chemotherapy for cancer, you should tell your doctor before taking a product with black cohosh in it or any other herbal supplement. If you are experiencing some of the common symptoms of menopause, such as hot flashes or insomnia, it's possible herbal dietary supplements such as Estroven may help ease some of your symptoms. However, you should know that more research is needed to determine if the supplement is safe and effective, and side effects are possible. While you don't need a prescription, and Estroven products can be purchased over the counter at most major retailers, pharmacies, and online, you should still talk to your doctor before starting Estroven or any other herbal or dietary supplement. You should not take Estroven if you are pregnant, nursing, or are trying to get pregnant. Estroven does not contain any hormones and is not known to interact with any medications, but you should still tell your doctor if you are taking Estroven products. Black Cohosh. National Center for Complementary and Integrative Health. Published November 29, 2016. Menopause and Hormones: Common Questions. U.S. Food and Drug Administration Home Page.